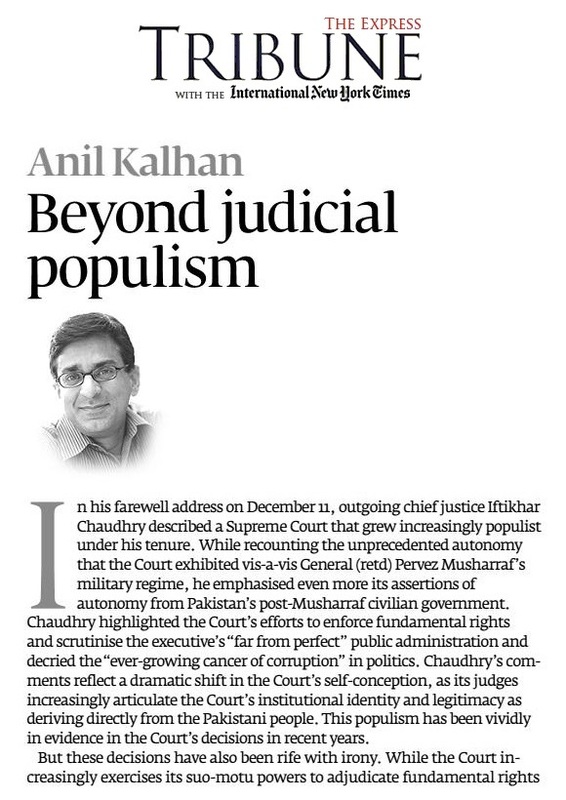 In his farewell address on December 11, outgoing chief justice Iftikhar Muhammad Chaudhry described a Supreme Court that grew increasingly populist under his tenure. While recounting the unprecedented autonomy that the Court exhibited vis a vis General (retd) Pervez Musharraf’s military regime, he emphasised even more its assertions of autonomy from Pakistan’s post-Musharraf civilian government. Chaudhry highlighted the Court’s efforts to enforce fundamental rights and scrutinise the executive’s “far from perfect” public administration and decried the “ever-growing cancer of corruption” in politics. Chaudhry’s comments reflect a dramatic shift in the Court’s self-conception, as its judges increasingly articulate the Court’s institutional identity and legitimacy as deriving directly from the Pakistani people. This populism has been vividly in evidence in the Court’s decisions in recent years. But these decisions have also been rife with irony. Continue reading at Express Tribune….